At the Battle of Lansdown Hill (1643), Sir William Waller attempted to defend Bath and with it prevent the King’s forces taking control of the rich resources of South West England. Under the command of Sir Ralph Hopton the Royalists won but paid a heavy price after storming the high ground held by their opponents. Following the commencement of substantive hostilities following the Battle of Edgehill in October 1642, the Royalists sought to secure the South West of England for the King. Cornwall's tin trade was essential for funding the war effort whilst the area included significant and defendable ports - notably Bristol - that would be essential for importing war material from Ireland and the continent. Given the importance of the South West, Sir Ralph Hopton raised an army for the King and attempted to secure Devon by taking Plymouth and Exeter but failed on both counts. Parliamentary forces counter-attacked but Hopton's victories at the Battles of Braddock Down (on 19 January 1643) and Stratton (on 16 May 1643) gave him a free hand. Rather than renew his assault on Exeter, Hopton moved to secure Somerset and Avon; in particular he sought to dislodge the Parliamentary army in Bath under Sir William Waller, Major General of the Western Association. 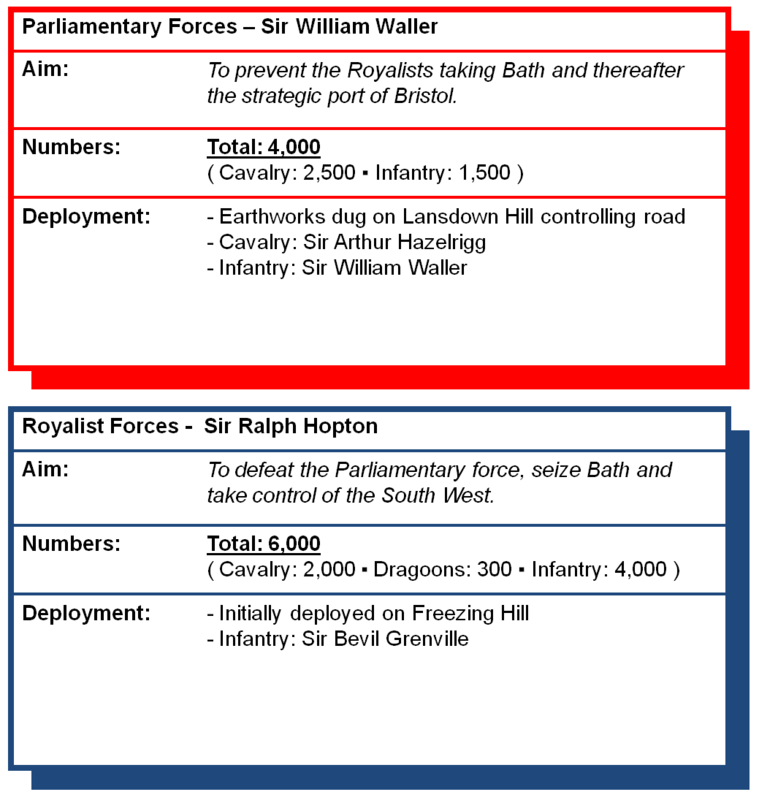 If Waller could be defeated, Bristol would fall to the Royalists. The Royalist force had arrived in the vicinity by 3 July 1643 and they attempted to penetrate the city from the South East. Waller blocked them at Claverton Down and Hopton judged his position too strong for a direct assault; instead he moved the Royalist force north seeking to engage on more favourable terms. On the 4 July Waller had occupied Lansdown Hill with the Royalists to the South East; again a decision was made not to attack as the Parliamentary position was too strong. Instead the Royalists continued to skirt around Bath to the North East of the city. 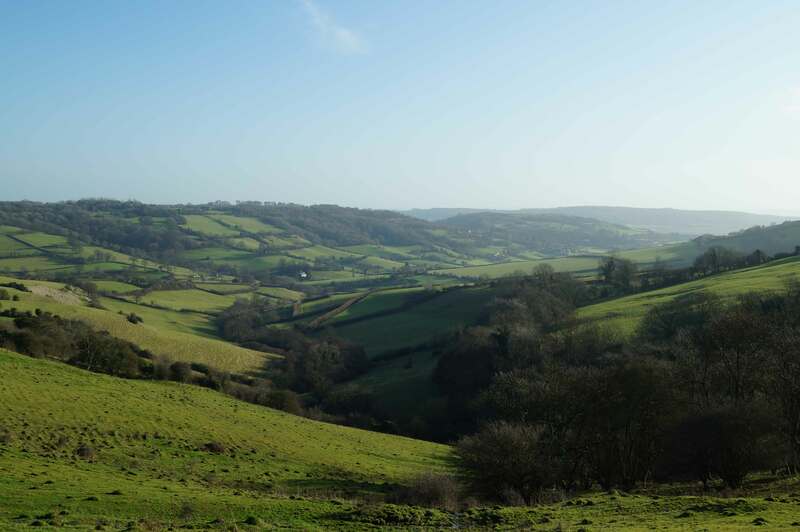 On the night of 4 July Hopton positioned his main force at Marshfield with forward units stationed to the north of Waller (who was still on Lansdown Hill) on the bleakly named Freezing Hill. The Royalists had a force of around 6,000 which was under the overall control of Sir Ralph Hopton. This included approximately 2,000 cavalry under Prince Maurice and an additional 300 dragoons (mounted infantry). The remainder were infantry which suited the enclosed and partially wooded terrain. The Parliamentary force under Sir William Waller was significantly smaller; about 4,000 men in total. 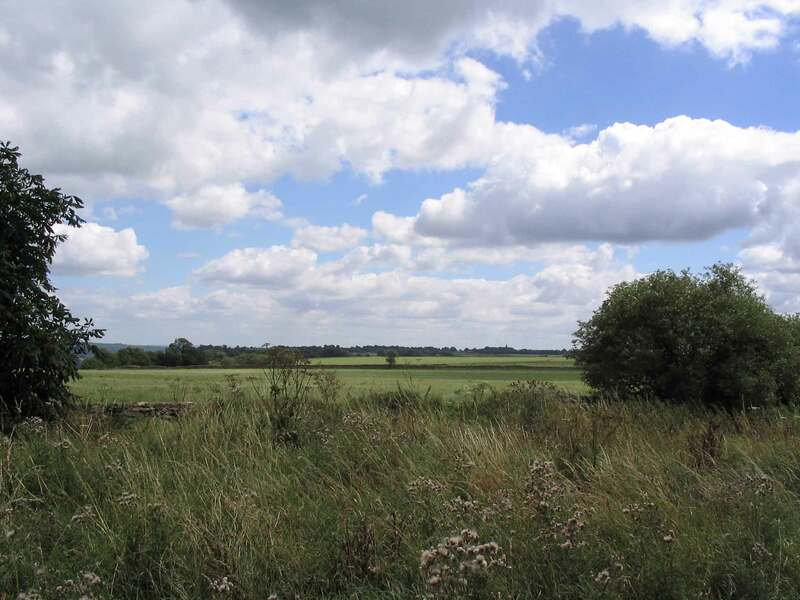 Critically only 1,500 were infantry and in the enclosed landscape, which favoured a foot action rather than a cavalry attack, this was a severe disadvantage. The battle was fought on 5 July 1643. Most of Hopton's force was in Marshfield, around four miles from Lansdown Hill, but advance elements had occupied Freezing Hill directly opposite Waller. The latter held a formidable position on the summit of Lansdown Hill protected by a steep ascent and earthwork defences which made a direct assault difficult. Despite his strong defensive position, it was Waller who attacked first. Mindful of his disadvantage in infantry, he commenced the battle in the early afternoon hoping to seize the initiative. He sent his large cavalry force, under Sir Arthur Hazelrigg, to engage the forward Royalist forces on Freezing Hill. Skirmishing commenced with the Royalists retreating which in turn prompted Hopton to mobilise his infantry at Marshfield. Waller deployed his cavalry reserve hoping to capitalise on his initial success but as Hopton's infantry started arriving in ever greater numbers, the Parliamentary cavalry was driven off Freezing Hill. Hopton now launched an all out offensive against Waller's fortified position on top of Lansdown Hill. Detachments of musketeers pushed at the Parliamentary flanks whilst the main body of cavalry and pikemen with supporting musketeers advanced in the centre along the Bath Road. For the Royalists it was a bloody, uphill slog. After being repulsed on multiple occasions they finally gained a small foothold on the plateau of Lansdown Hill. Waller threw his cavalry back into action trying to displace them but, whilst the Royalists suffered heavy casualties, they held their ground. With the Royalists slowly expanding their foothold on the northern edge of the plateau, albeit at great cost, Waller withdrew 300 metres to the south. 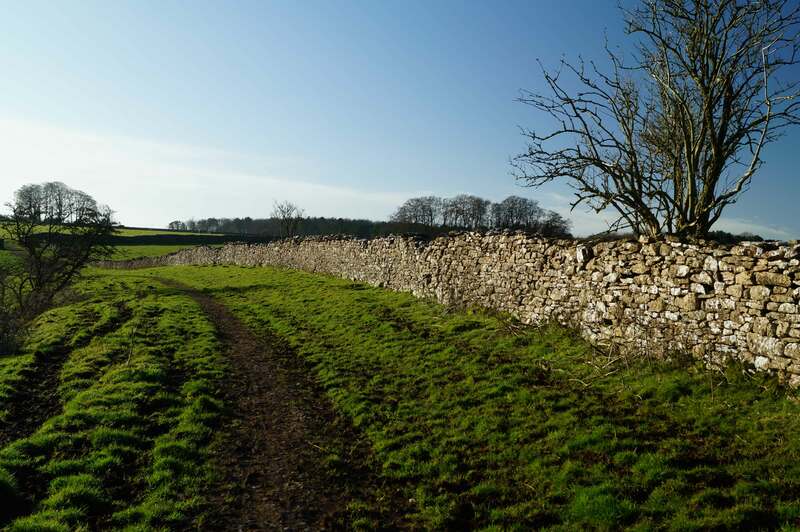 He placed his musketeers behind a stone wall with the flat plateau of Lansdown Hill now a no-man's land. The Royalists, having suffered significant casualties taking the hill, had now lost momentum and had no appetite for storming the new Parliamentary position. They were however resolved to hold the land they had captured; Waller's attempts to dislodge the Royalists with cavalry failed. Ineffective fire was exchanged between the forces until around 11pm when Waller withdrew south towards Bath leaving the field to Hopton. The battle was a nominal Royalist victory but was not decisive and failed to settle the issue of control of South West England. Despite his withdrawal, Waller's force was intact and had suffered minimal casualties; almost certainly less than 100 killed or injured. By contrast the Royalists had suffered significantly more which was inevitable given they were storming a well defended position uphill. Estimates suggest around 200-300 killed and large numbers wounded including large numbers of cavalry. The dead included one of the senior Royalist commanders, Sir Bevil Grenville. The heavy casualties at Lansdown demoralised Hopton’s force and things got worse when, within days of the battle, the Royalist commander himself was temporarily incapacitated by a gunpowder explosion. All this, coupled with low ammunition, led to the Royalists withdrawing to Devizes and giving up the original intention of taking Bath. Waller, having re-invigorated his own force, pursued them. A further battle was fought on 13 July 1643 at Roundway Down but here Waller's luck ran out; his force was effectively destroyed. The Royalists captured Bath in the subsequent days and on 26 July 1643 Bristol was taken. Whilst Plymouth would hold out as a besieged Parliamentary enclave, the all-important South West was now held by the King. English Heritage (1995). 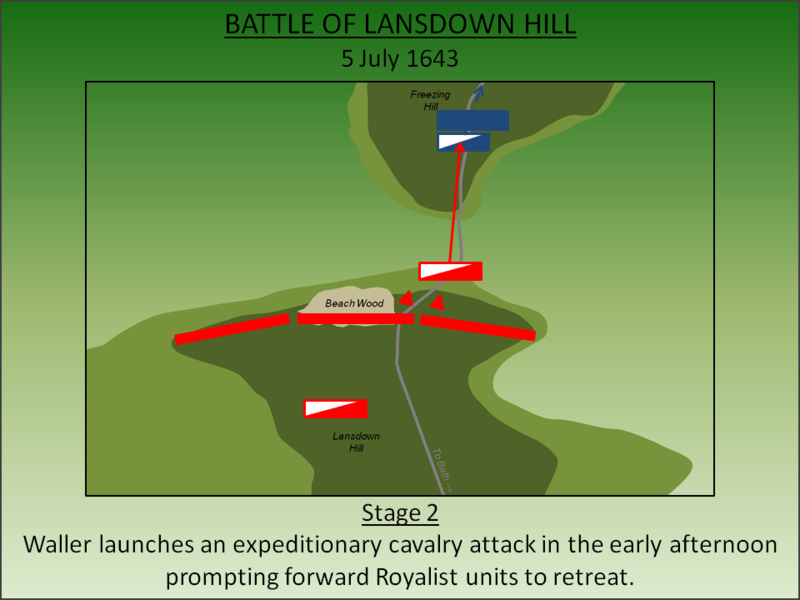 Battlefield Report: Lansdown Hill (1643). Swindon. Healey, C.E.H (1902). Colonel Slingsby's relation of the battle of Lansdown and Roundway Down, July 5th. Somerset Record Society 18. Husbands, E (1643). A true Relation of the great and glorious victory, through God's Providence, obtained by Sir William Waller, Sir Arthur Haslerig, and others. London. Lancaster, J.H.D (2012). Lansdown Hill: Battlefield visit notes and observations. CastlesFortsBattles.co.uk. Ordnance Survey (2015). Bath and North-East Somerset. 1:1250. Southampton. Waller, W (1643). Letter from Sir William Waller to the Speaker dated 12 July 1643. Battlefield Walk. The circular walk starts at the lay-by and passes the battlefield monument. Sir Bevil Grenville Monument. Grenville’s Cornishmen had fought hard to gain a foothold on Lansdown Hill. He received a mortal wound during the fighting and the monument was raised where he fell. Plateau. A view of the plateau which became the no-man's land after Waller withdrew 300 metres from his position on the summit. Waller Withdraws. 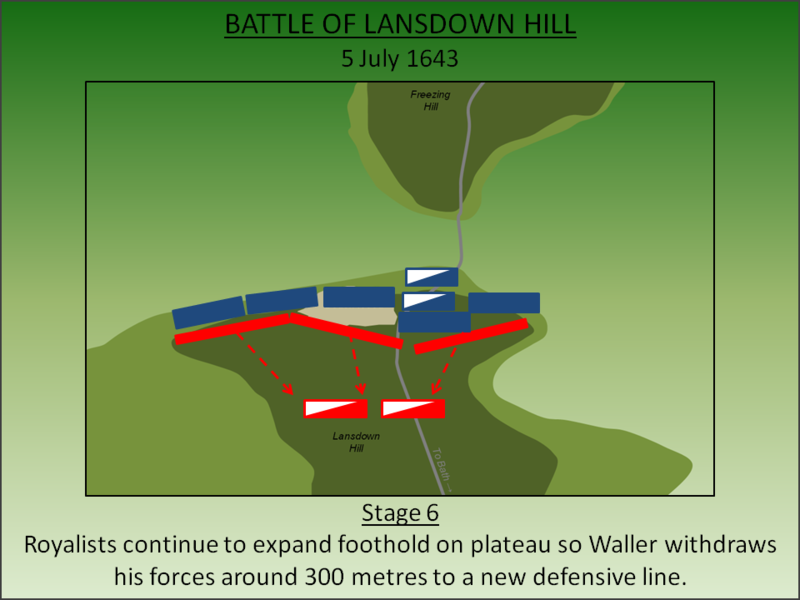 After the Royalists secured a foothold on Lansdown Hill, Waller withdrew his men around 300 metres behind a stone wall where they established a new defensive line. Waller’s Retreat. Sir William Waller withdrew his forces around 11pm and headed towards Bath. His force was very much intact however and a week later he would fight another battle with Hopton at Roundway Down. The main battle was fought on the slopes of Lansdown Hill. 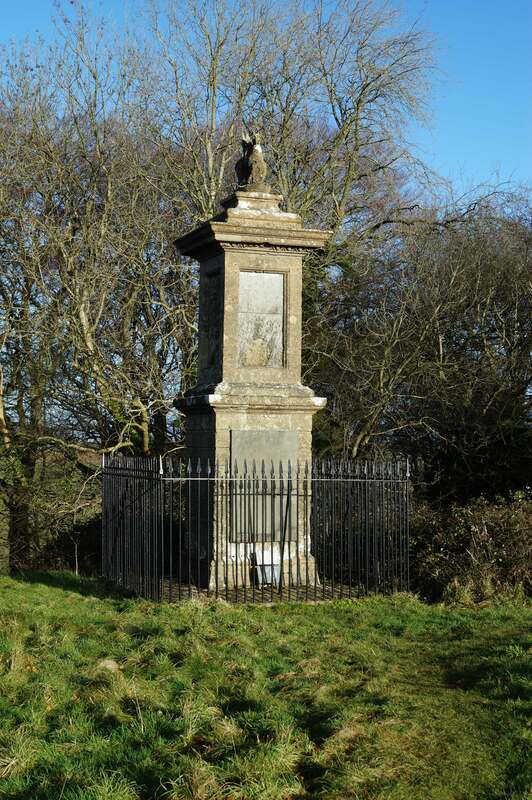 There is a lay-by on the Bath Road that allows access to the monument, battlefield walk and Cotswold Way.